During the summer time, people plan out their vacations or short trips with the family to spend the good time, but it surely requires packing the items which you would need instantly, and drinks are a big part of it. Whether you eat much during the trip or not, you have to keep the drinks with you. The cooler – the better. Well, backpack coolers provide you the comfort to have instant drinks that are cold and chill. You do not have to wait for any shop to stop by and grab the drink. You will be able to enjoy the time with having drinks with you in the car. No more carrying the chest of ice cubes since the amazing and advanced backpack coolers are here a common thing nowadays. You can check out some of the great backpack coolers which are in trend and pick any of these according to your own choice. 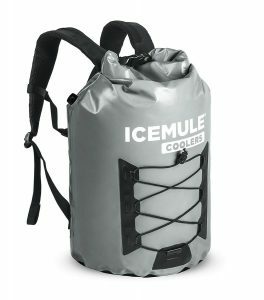 The IceMule backpack cooler provides you the ultimate experience throughout the trip. It contains all the items in order within one backpack that is required for the trip. It is easily portable and light in weight to carry anywhere you want. The capacity is large with cooler features to keep the drinks cold all the time. The cooling is continuous for 24+ hours without any leakage or damage to the backpack or the food items. The straps are padded with soft material and provides great comfort to the users. It can carry up to 18 cans but also leave the space for other items to be placed too. The bag design is innovative by having high insulation with being heat sealed. The fabric is made out of MuleSkinET which is tougher on the inside of the backpack. It protects the items from any outdoor activity and keeps it secure. The retention of ice is great with having cold drinks available at any time of the trip. You do not have to wait for the drinks to cool down in the summer anymore. IceMule backpack cooler works as an ideal backpack whether you are going on the trip alone or with the entire family. Front pockets to give the support of placing instant things like bottles, cellphones etc. 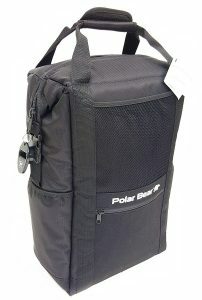 Polar Bear backpack cooler is like no other because of the high-quality material used in the fabric. You can surely trust the brand and depend on it to provide you with a great experience. This backpack comes with high-density features of insulation and the foam insulation which keeps the items cool for days. The liner interior works good for any type of food and it can be placed and it can be perishable at any stage. 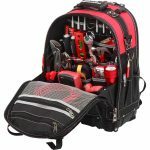 It is known to be one of the best backpack cooler to depend on. The liner works for a long time where you do not have to think of purchasing a new backpack after the frequent usage. The nylon outer shell provides you with all the double features which are beneficial for the users. The pockets are zipped which keep the items secure at all times. The softly padded straps provide a comfortable feel without making you feel tired or sore at any point during your trip. Multiple functions such as zips, pockets, extra pockets etc. Backpack cooler by Coleman contains huge capacity for the items to be placed easily. It can carry up more than 20 cans at one time. The pockets are large and zipped tightly for the safety of the bag. The straps are comfortable to wear all day long and do not make your shoulders hurt. It provides great support to the people who love to go on trips, picnic, hiking or beaches. The straps are adjustable according to the size of the person, and it can also be used both by females and males with being available in the Khaki color. The backpack is leak proof by having heat sealed insulation in it. There is no way that the cans will get warm even if they are in it for the entire day. You can drink the can anytime you want and the chill temperature will give you a good relaxing. The handle on the top allows you to carry the bag easily if you are moving quickly or do not feel like carrying the backpack on the shoulder. It’s a stylish bag which has a huge benefit of a large capacity. The extra padding allows you to carry it on the shoulders for a long time. This backpack makes the trip a lot easier by carrying all the necessary items needed for the trip. The front pockets work as the extra storage to keep any instant snacks which you can eat on the way to your desired location. A durable and reliable backpack cooler by Igloo is all you need when you are going on a trip during hot and long summers. It keeps all the food placed in the backpack cool, and you do not have to depend on anyone for the cold drinks in hot summer. You get instant help right from your backpack cooler which will play a role of ease at that time. The backpack cooler is convenient and easy to use effortlessly no matter where you are. The softly padded shoulder straps allow you to keep on wearing it for a long time without any hassle. The UV protection in the backpack keeps the item secured and perishable whole day long. You can clean this backpack easily anytime you feel like it needs a wash. 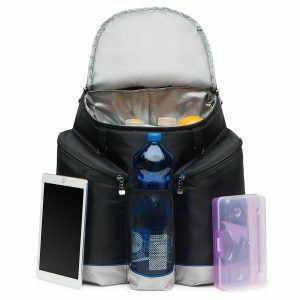 The backpack provides long cooling so even if you have to travel for days, then you will have all the cold drinks available anytime. The high insulation provides the items to stay fresh which you can grab anytime. It is light in weight and comfortable to carry on beaches, hiking or any outdoor place. 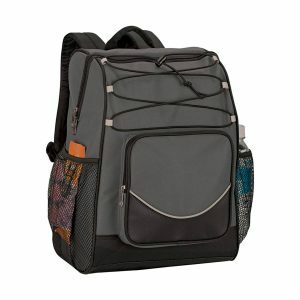 The backpack is odor resistant,so even if you have multiple food items in it, there will be no odor. 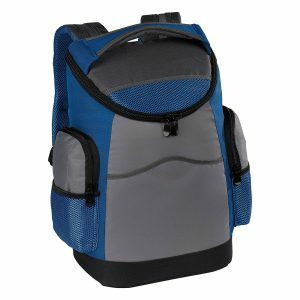 Backpack cooler by Dakine provides pockets with insulation which keep the items cool inside. There is a space for gadgets in this backpack which keeps them safe. The pockets on the side are mesh and made out of strong fabric. 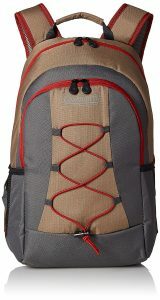 The Dakine backpack is made of polyester with the smooth straps to carry the backpack. It can carry heavy items easily without letting the effect of weight occur on the shoulders. The straps are adjustable and provide comfort for the user. For the gadget lovers, there is additional space in the bag, so it stays safe out of any leakage of the items within the backpack. The easy access to the bag allows you to grab the items even if you are wearing the backpack. It contains huge space to keep everything you need for the trip such as clothes, sunglasses, sandals and much more. 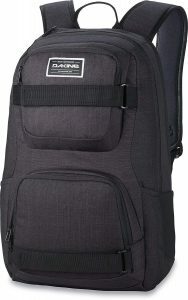 Dakine backpack is made of a high-quality material which provides ultimate experience to the users. The amazing design of this backpack allows you to keep multiple things in one place. Food, gadgets, accessories fit in Dakine backpack perfectly without making it heavy for anyone to carry it along. OAGear backpack cooler holds up to more than 20 cans at the same time without leakage. It is a great bag to use if you are going hiking, beach, camping and more. The liners are heat sealed which keeps the drinks cool all the time. Now you do not have to carry the bucket of ice cubes anymore because of the advanced backpack coolers. There are two side pockets outside which let you place items needed instantly like bottles, cellphones, gadgets and others. They are secured and zipped which can be accessed even if you are walking and the backpack is on your shoulders. The padded shoulder straps help you to carry the bag for a long time which does not exhaust you as well. You can easily work or do anything by carrying this backpack, and your hands will always be free. You do not have to hold the bag or worry about the items in it when you are hiking. In the hot summer, your chilled drinks would be available instantly through this amazing large backpack. It is safe to use and you will have a great experience as you enjoy your free time with your loved ones. The amazing heavy duty backpack cooler works as a great piece for you to carry when you are thinking to go to beach. 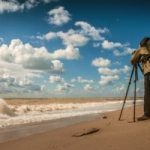 If you are someone who visits the beach often, then this is a great backpack to have for long-term use. The fabric has its insulation with thick foam which is useful for the air passage. It is heat sealed due to which the items in the backpack stay cooler. The liners are removable with padded pockets at the side of the bag. The zippers are strong and it can be carried easily even while you are hiking. It is affordable in cost with the warranty of a lifetime, unless there is any defect by the consumer. It gives you the peace of mind with having all the items in one backpack without carrying anything extra. The material is made out of tough fabric so even if it gets used roughly, it will not tear for years. The fabric is comparatively stronger than all the other backpacks which can last longer. There are multiple pockets in this backpack which can keep the things secured while you can enjoy the beach. The zippers are strong and do not open unless you manually open them. The softly padded shoulder straps help you carry the bag for a long time without being tired. Multiple pockets to keep small items like cellphone, juice etc. Huge capacity to keep clothes, shoes etc. Royal Backpack cooler by OAGear can hold up to 20 cans at one time. There is extra storage to place other items in the backpack which you can easily access. The backpack is heavy duty with having heat sealed insulation. The strong liner protects it from getting leaked. The polyester material makes it convenient to carry during the summer time. The liner is made out of PEVA protection along with the broad at the bottom. You can place the cans easily in order. The pockets on the front and the side allows you to put anything such as snacks, cellphone and more. You can easily grab them without taking off the backpack from the shoulder. The straps are soft and comfortable so anyone can wear and enjoy the backpack. This backpack is secured, and there is no worry about the food items since they stay fresh due to the high-density insulation in the bag. Now you do not have to depend on the ice cubes but simple reach to your backpack and enjoy the cold drink instantly. Backpack cooler by Igloo is made of the polyester material with the comfort you need for traveling. You can carry it at any party place and enjoy the cooled cans/drinks in it. There are two parts attached to this bag. The bottom one is available separately which can be accessed easily for the food items. Whereas, the top one allows you to have your personal belongings, yet do not have any interaction with the food compartment in the bag. It is stylish and fashionable to be used by both females and males when they are planning a picnic. It can work as a tote or a backpack for you to have multiple items at the same place. You do not have to carry the things in your hands, but this one bag will do carry everything you need for the picnic. You can also place the divider within the compartments if you wish to. This bag gives you the ultimate experience which you need for the trip. It has a huge capacity for you to carry all the necessary items which you need for the trip to be enjoyed. 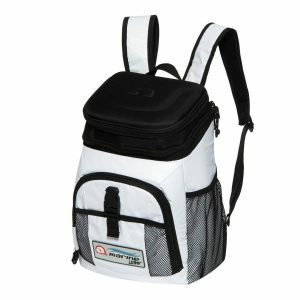 A great backpack cooler you can use for traveling by ONIVA is close to perfection. The durability of this backpack helps you stay convenient throughout your trip without worrying about the drinks. It is made of polyester material along with different sections in it. The drawstring allows strong hold of items in the backpack for the smooth air passage. The insulation process is provided by ThermoGuard which keeps the items cool along with leaking protection at any time. The shoulder straps are padded and safe to carry on the shoulder even if you are hiking. The front pockets allow you to keep the accessories needed which you can get by extending the arm and reaching behind your back. You can place a little towel, cellphone, bottle or anything in those small pockets. The pockets are big and stylish where you can place multiple things to have the access easily and quickly. The space in the bag allows up to 12-13 cans placed at the same time. You do not have to store the chest of ice cubes anymore when you have ONIVA backpack cooler. You will have no problem in carrying it on your back even if you are on the trail. This backpack gives you an amazing and upgraded look to enjoy your trip without any hassle. Choosing the best backpack cooler can be difficult when you have multiple options. It is always better to look for additional information when you are searching to purchase an item. Different products have various features which you may like, while some of them might not be the most suitable for you. Among all, there would be few which would fit your choice which is why there are various options available for you. The first thing which you have to do is to set the priority. The reason why you need the backpack, is for beaches, for hiking, camping or any other reason. Know the reason and then look into the specific category. The material of the backpack matters a lot because you have to carry it on your shoulders. It needs to be strong and should not have any chance of leakage. As you would be placing liquid items in it, so it needs to be an anti-leakage backpack. Another important thing to consider is that it needs to be comfortable. You have to make sure that the shoulder straps are padded which does not make you tired and your shoulders sore when you wear it. As the bag can get heavy when you place multiple items, you need to make sure that they are adjustable so you can easily carry it with anything inside. Storage matters because if you are traveling for a day or more than a day, then you would need more items in the backpack. Consider choosing the backpack depending on the activities which you aim to do when you are planning a trip. You might need clothes, boots and other accessories as well, so consider the option of big storage in the backpack. Some backpacks come with compartments which are a great deal too. It keeps the separate place for the cooler bag and another for keeping the accessories so that it stays away from all the insulation. The insulation compartment is at the bottom for you to keep the drinks or any other food items. On the top compartment, you can keep all the necessary accessories which you may need such as gadgets, clothes, shoes and more. If there would be a bag with a lot of pockets and some of the features, then you need to consider it because it provides you with more space. The pockets are zipped with the backpack coolers because it keeps the items secure when you are traveling or going for a hike. You can reach out to the pockets even if you are wearing the backpack. You do not have to take off the backpack to get anything you want,but instant reaching is possible. The great backpack coolers work as an extraordinary item due to high technology. 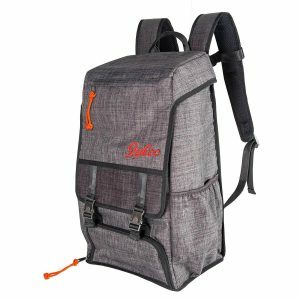 The trips have become easier because of the backpack coolers so if you like to visit outdoor frequently then choose a best backpack cooler which can work for a long time. Set the list of features according to your needs and then try to look for the best one that matches your expectations. Some may like the ones which you do not like, so it is completely a personal choice. Once you have the backpack cooler, you will be glad that you have purchased it and it has made your life much easier than before. Backpack coolers are exactly the same like the normal backpacks you can see everywhere, however, unlike usual backpacks, backpack coolers use special material to insulate the interior of the backpack in order to protect it from the outside heat. For how long do backpack coolers keep the drinks cold? This mostly depends on the area you live in and how hot it is outside, but most backpack coolers can keep drinks and food cold for hours. Can you cool anything else other than drinks in a backpack cooler? Sure you can! Backpack coolers aren’t used to only keep drinks cool, but also food. If it fits in the backpack cooler, then you can keep it cool. What is the biggest benefit of a backpack cooler? The biggest benefit of a backpack cooler would be its versatility and its integration. You probably wouldn’t even notice the difference between a normal backpack and a backpack cooler at first. However, it can keep the drinks cold and chill whenever you’re going on a long trips or outdoor picnics. How to backpack coolers work? Without complicating the science of the materials and the special design and craft, it’s easy to say that backpack coolers use special material on the inside which insulates the interior. Therefore, the sun, heat and UV lighting can hardly get to the interior of the backpack. Are there any backpack coolers available for kids? Of course there are! They’re also very useful for kids who often go to school trips where they need to have their own drinks and food. Getting a good backpack cooler may be hard when you see so many options. It depends upon your priority and the choice which you would like the best. The reason for providing so many options is that you can view multiple ranges of items. 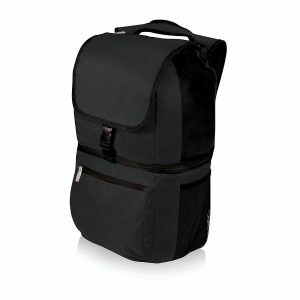 The great invention of backpack coolers is available everywhere, but here, you will be able to choose among the top 10 backpack coolers which would work great with you for a long time. They will surely provide a great experience, and you will be glad that you have decided to choose one among these ten backpack coolers.